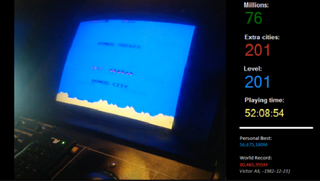 Victor Sandberg of Sweden has been playing Missile Command for more than 52 hours on a single coin, chasing a record that has stood since 1982. The all-time high world record high score of 80.5 million points is held by another Victor, in this case someone named Victor Ali. [Update] Victor Sandberg is the new Missile Command world record holder, finishing with a score of 81,796,035 in 56 hours, 5 minutes, 53 seconds. You may follow the livestream of his progress below. Patrick Scott Patterson, the eminent arcade game records observer, advises that this is one of the records long considered unassailable in video game history. But as was proven in February, just such a record—the 30-year-old Q*Bert all-time high—is capable of falling. You can follow the attempt at the link below.